The Cato Institute has a report on the libertarian vote, which they consider to be the new swing vote, accounting for about 13% of voters. Libertarians voted more heavily Republican in the past, but have become disillusioned with Republicans due to the war, their record on civil liberties, social issues, and possibly due to their support for corporate welfare. They note that libertarians supported Bush over Gore by 72% to 20% but Bush’s margin dropped to 59% to 38% when Bush faced John Kerry. While the Cato Institute attributes this shift towards Democrats in 2004 as opposition to Bush’s policies, they may be underestimating support for Kerry’s positions. The Cato Institute greatly misunderstands Kerry’s positions and misses his libertarian leanings on some positions. They ignored Kerry’s opposition to going to war, and confused Kerry’s vote for the IWR as support for going to war as opposed to authorization of the use of force as a last resort if we were proven to be threatened by WMD. (Kerry’s actual position on Iraq was discussed here). They ignore Kerry’s strong support for civil liberties due to his vote for the Patriot Act, which is also misleading. All but one Senate Democrat voted for the Patriot Act not out of support for the act but as part of a compromise to have sunset provisions added. They also confuse Kerry’s personal opposition to gay marriage (while supporting civil unions which provide all the benefits of marriage) for his political actions, with Kerry consistently opposing restrictions on gay marriage. During the campaign, Bill Clinton advised Kerry to support the amendments opposing gay marriage in the states where they were on the ballot, advising this would increase his support in those states. Kerry refused to compromise his principles in this manner. They ignore Kerry’s history of strong support for small business and balanced budgets. They use support for private accounts in Social Security as one of their litmus tests, but this is not necessarily a libertarian position. Both the present program and a government sponsored private savings account system would remain a government program, so it comes down to a choice between two government programs, not a choice between a government and a non-government program. Moving to private accounts leaves the problem of funding benefits for current retirees if those currently working shift their money into private accounts, necessitating increased taxation or deficit spending which would be contrary to libertarian goals. (Private accounts would have been much more realistic if Bush had not squandered the budget surplus left by Bill Clinton). The Cato Institute might be motivated to exaggerate their political significance, but the move by Democrats towards support for civil liberties and liberal social issues, accompanied by support for fiscal conservativism, has benefits beyond the libertarian vote. This is also the formula to attract many suburban voters, Western voters, Starbucks Republicans, and South Park Refugees. The trend towards more libertarian views among Democrats can also be seen in Kos’s adovcacy of Libertarian Dems. Republicans have often benefited politically by their rhetoric supporting freedom and capitalism, but their actual policies have been quite different from their rhetoric. A party which interferes in the intimate details of individual’s lives to the degree advocated by the Republicans is hardly the party of individual liberty. The crony capitalism practiced by the Republicans to transfer wealth to the large corporations which support them and to the ultra-wealthy has no relationship to the views of Adam Smith. Democrats have a clear advantage in support for civil liberties and opposition to the war, and even on economic issues are often closer to libertarian views once you get past the Republican rhetoric. Despite strong early support for the Iraq war in the South, the region’s opposition to the war now matches national levels –- and by some measures frustration is higher in the South than elsewhere in the country. Those are the findings of a new public opinion poll run by the Institute for Southern Studies and the School of Public and International Affairs at North Carolina State University. The national survey, which included a larger poll or “over-sample” in 13 Southern states, offers one of the first in-depth looks at Southern attitudes towards the Iraq war since the Bush Administration pressed for military action four years ago. *** 57% of Southerners believe the U.S. “should have stayed out of Iraq,” compared to 44% who think the U.S. “did the right thing” by taking military action. Nationally, 58% of the public believes the U.S. should have stayed out and 43% now agree with military action. 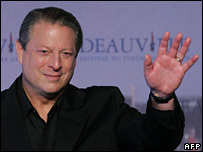 Al Gore has won a Qwill Award for An Inconvenient Truth. The Qwill Book Awards will be broadcast in the United States by NBC on October 28. Mark Warner has announced he is not running for President in 2008. At this point I’d suspect that John Edwards benefits the most if he can run as the southern candidate (although Wesley Clark might prevent this). Previously Warner was getting the bulk of media attention from those who buy the idea that nominating a moderate from the south is necessary for Democrats to win. Bush might not be a right wing religious fanatic–he’s just using Christians for political gain according to Tempting Fate, a new book by former Bush assistant David Kuo. Does this mean Bush didn’t mean it when he claimed that God chose him to be President and advised him to go to war in Iraq?